With our western theme, we offer true Texas hospitality and a taste of the Old West. 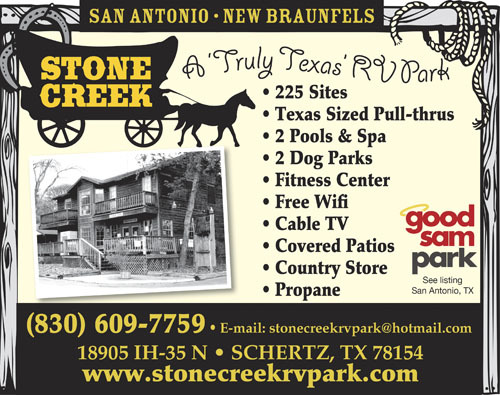 Only minutes to San Antonio & New Braunfels attractions, we are freeway close yet country quiet. 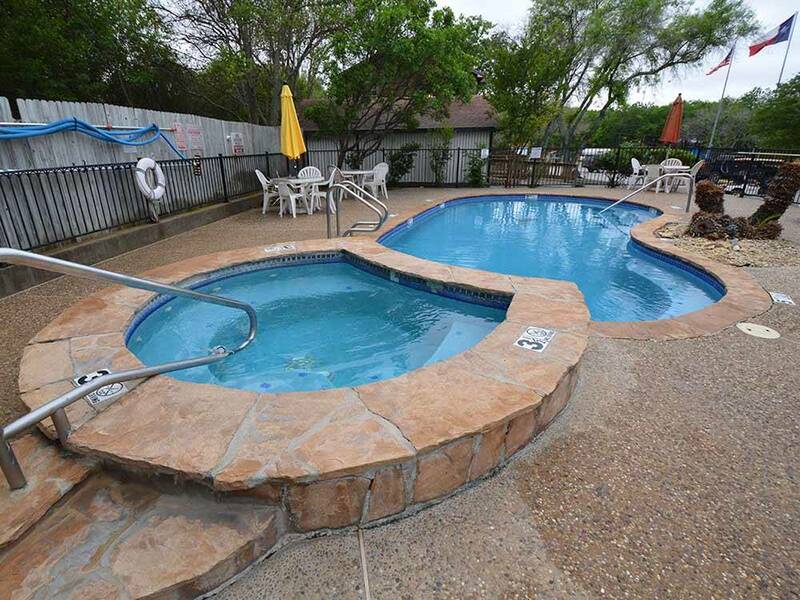 Fun pet parks and a relaxing pool for you. Place is run down and showing its age. I think it is supposed to look like the rustic country look of Texas, but the fence leading into the park and the porch around the office looks rickety and falling apart. I thought it would get better under new management, and it has, but driving by recently verified that it is still drab and looks like it is barely holding on. Wood does need to be replaced every once in a while. There is no parking at the recreation hall and definitely need a remodel with working appliances. The bbq pits they provide are filthy. The daily stays in the front two rows are well maintained, but if you are paying for monthly you do not get a light for your space. Road are in horrible condition and they do not enforce speed through the park. Forget about the people who talk loud in the mornings and music being played loud by drivers. Unless these things change, I and my friends will not stay there again. We stayed here during our visit to the Natural Bridge Caverns and Wildlife Ranch. The staff was very friendly and the place felt very rustic and had a nice home feeling. They had separated small and large dog parks which was very nice. Everything was in close proximity with easy access. I did not rate the bathrooms because we did not need to use theirs. The atmosphere is wonderful and it is pretty well organized. The reason for 4 stars instead of 5 is because of the condition in certain areas. None of the park was dirty but you can tell old areas that could use some upgrading as well as in some of the "permanent" or "long term" guests are not so much on keeping to the level of standards one would expect. It really is a great place to stay though and we will return. We were originally going to stay here 5 days, after 2 days we had to leave, we were put in a pull thru site where there was no people around so I assumed they were permanent, the site was filthy with trash strewn around and once we parked the front end of motorhome was off the ground, not a level site, no picnic table either. They did give me a refund for the remaining 3 nites and the woman in the office had no personality, if she could of only smiled!! I don't know how this park got such a high rating. Stayed at this campground to visit family in the area. Staff was friendly. Didn't use many of the facilities, but did look around at them and they are adequate for our needs. There are many long term folks there, but park appeared to be well kept up. Is this a million dollar resort? Nope. But was it good for what we needed. Absolutely. If you are looking for Disneyland, look somewhere else, but if you are looking for a quiet, friendly camping space from which to tour the area and/or visit friends and family, then this park should fill that need. We had a wonderful stay. They have a large breed and small breed dog park. The sights are gravel, well maintained, not perfectly level. The setting of the park is nice and relaxing. There are weekly activities from pot lucks to ice cream socials. The park made everything from sight seeing to merchants very accessible. We will stay here again. So I have been here for over a year and here are my observations. Firstly I have experienced the park raising their rates 2 times since I have been here but nothing has changed by way of service or amenities, as a matter of fact the internet/wifi has gotten slower to the point of not working at all. Second the roads and RV spots are in very poor condition, bumpy and uneven. Lastly there is one particular employee (who does what around the park I'm not sure) but acts as though he is super cop or some kind of enforcement who will bark at you for doing (well about anything), so just read the rule book very well and believe me they have quite a few rules around here. To summarize, prices are way too high for what your getting. Sites in front are not level. We had to raise up about 6". RVs next to us had wheels off ground. Park advertises wifi but we could not access. Numerous complaints to office staff fell on deaf ears. Staff was indifferent. Most of the facilities were very run down. Wi Fi was almost useless. I thought the place looked like it catered to the long term or permanent people. Lots of flies. The recreation room with a leaky roof had TV that didn't work well. It was freeway close though. The staff tried to be helpful with what they had to work with. Sorry. I booked a week at this campground. When I got there, I wanted two more days. I was given a paper with the daily Price $44. I told them I was a Good Sam Member, showed them my card and ask for the discount. They said OK, printed out a receipt and I asked about the discount. They said you got it and I didn't look at the paper. When I got home, I was looking at the paper work and found out that they lied. They raised the daily price by 11% and then give me a 10% discount. So I paid more than I would have with no discount. The electricity went out on the street I was parked on. I went out to check the breaker, only to find all my neighbors out doing the same thing. My neighbor and I walked to the office to report it, it was closed. My neighbor started calling the "In Case of Emergency Number" and no one answered. He called it about 10 times, no answer. I called it another 10 times, no answer. After about an hour, the electricity just came back on. No one ever answered the phone or come out to work on it.